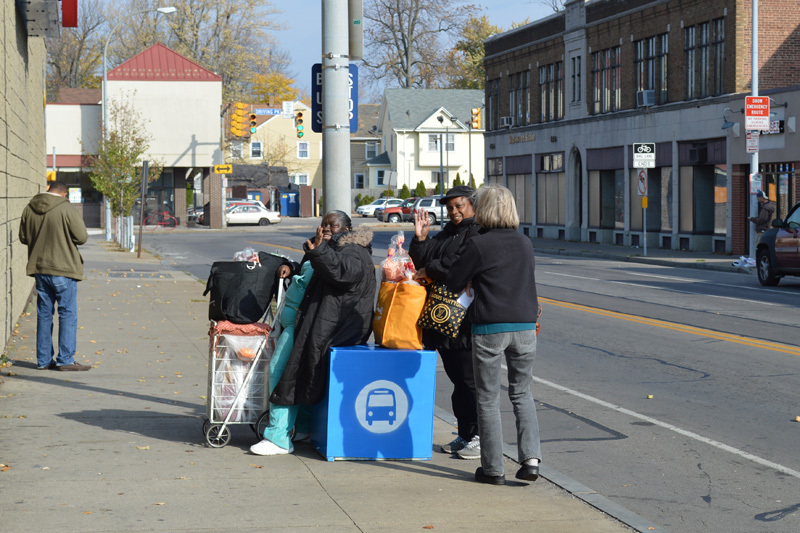 Rochester residents are experimenting with a simple idea to make riding the bus a little more comfortable. These women [pictured above] had just finished shopping and were waiting for their #10 bus when they were introduced to the CUBE seat. One of the women said that when she’s waiting for her bus, sometimes her legs give out. And she says the bus stop cube is the perfect height for her. She said many of the standard benches throughout the city are actually too low for her to get up out of easily. Reconnect Rochester also shot this video of live interviews with bus riders — the reviews were mostly good. The group is asking community members to pin spots on an interactive map to recommend future locations for cubes. They’re also seeking donations to support the project. Elsewhere on the Streetsblog Network today: Bike Walk Lee says the principles outlined at the recent Vision Zero symposium in New York should help guide street safety efforts in Southwest Florida. I Bike TO asks whether Toronto should build bike infrastructure for “cyclists” or for people of all ages and abilities. And the Urbanophile weighs in on Tony Hsieh’s bid to transform downtown Las Vegas into a live-work neighborhood. What's the cost of a long commute? If you're struggling to make ends meet, spending hours each day just to get to work can not only cost you time, it can also be a major barrier to economic mobility.